We offer two different different sizes. 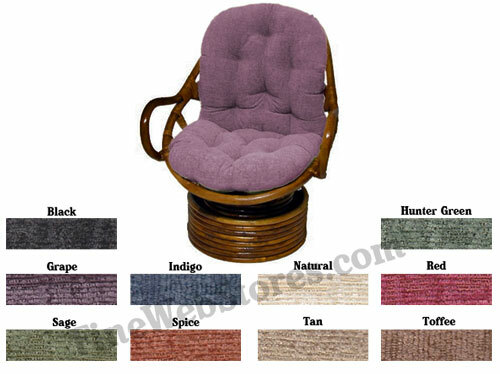 The newer papasan swivel rockers generally use a 24" x 48" cushion and the older styles use a 24" x 58" size cushion. You can measure your cushion size easily by laying your old cushion flat on the floor and put a tape measure to it. There is an extra charge for the larger papasan swivel rocker cushion. Swivel Rocker Papasan chairs are a comfortable fashion statement. The problem is many times the papasan chair frame outlives the cushion. FineWebStores.com to the rescue! We sell excellent quality replacement papasan cushions! Our cushions are approximately 5 inches thick and they are filled with soft polyfill.